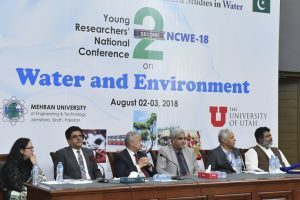 2nd Two-Day Young Researchers’ National Conference on Water and Environment (NCWE-18) has kicked off at U.S.-Pakistan Center for Advanced Studies in Water (USPCAS-W) at Mehran University of Engineering & Technology (MUET) Jamshoro on Thursday (Today). On the first day, Vice Chancellor MUET Dr. Mohammad Aslam Uqaili speaking in the inaugural session said that learning is continuous process leads not only to know the problems of the communities but offer the sustainable solution based on the applied research and knowledge transformation. He said the community is the ultimate beneficiary from the academic research and particularly from the academic research in water, energy and agriculture sector. Dr. Uqaili said that triple helix model had been replaced by the quadruple helix model in which the role of communities included in academia-industry-government relations. He said that three years back the MUET was selected to establish national water research center with the financial support of American people through the United States Agency for International Development (USAID) to contribute solutions to Pakistan’s water-related challenges by educating and training the next generation of water sustainability leaders. 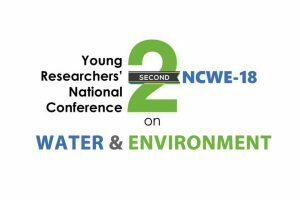 He said that apart from the academic program, USPCAS-W focuses on applied research in the water sector and this connection, the National Water Research Network (NWRN) has been established for joint consultation and undertakings and collaborative activities under the umbrella of the Water Center. He further said that this young researchers’ national conference is one of the nice initiatives taken by the Center last year and it will be continued further. He further assured for the full support from the Center for supporting government agencies to implement the water policies and water agenda. Project Director Dr. BakshalLashari in his welcome address said that the Center lays primary focus on Sustainable Development Goals (SDGs), particularly SDG6 “to ensure availability and sustainable management of water and sanitation for all.” “MUET Water Center is helping Government of Sindh in providing safe and clean drinking water,” he added. 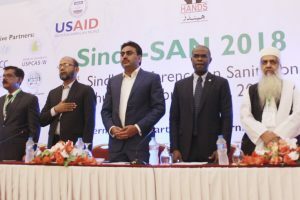 Dr. Lasahrithanked USAID, the University of Utah for providing technical support to the Center, Higher Education Commission (HEC) Pakistan, Government of Sindh and other organization for their generous support for the Center. He further said that this conference is possible primarily because of the interest and enthusiasm of the young researchers, scholars and graduate students who have taken upon themselves to organize this event on a yearly basis through the participation of their counterparts and interested scientists from other organizations throughout the country. 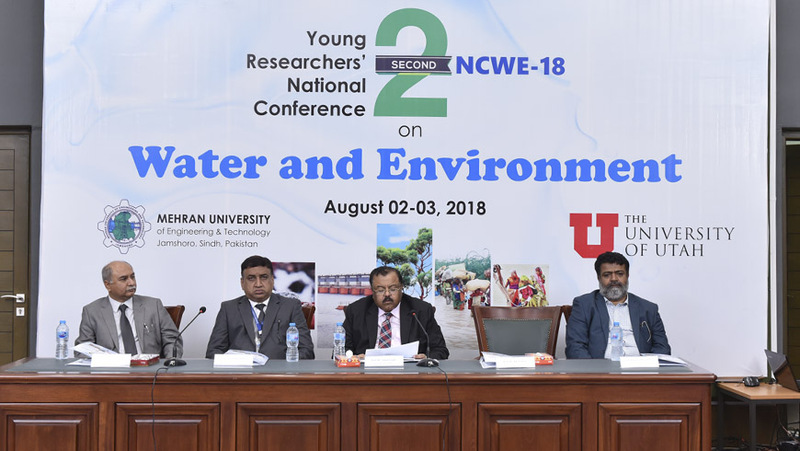 Conference Convener Dr. Kamran Ansari said that the conference aims to provide an ideal academic platform to young researchers and scholars from all over the country to present, share and exchange their latest findings of water and environment-related issues. He further highlighted that the papers on different themes of the conference would to provide opportunities to delegates throughout the country to share their scholarly knowledge, skill, experience, and expertise with a focus on water, environment and shared challenges facing our current and future generations. “A set of recommendations of the conference that help us translate the overall objectives of the conference and lead to some actionable plans in the field of water and environment,” he added. Dr. RasoolBux Mahar presented the vote of thanks and thanked all the participants for joining in the conference. In the plenary session, Director General Pakistan Director General Pakistan Council of Research in Water Resources (PCRWR) Dr. Mohammad Ashraf said that if the ratio of population, urbanization, crop pattern will remain same then by 2025 Pakistan will reach to zero level as far as water is concerned. By referring to water loopholes, Dr. Ashraf said that poor coordination amongst policy, research and development institutions made the water situation worst. He said that complete neglect of construction of large reservoirs after the 70s deteriorated the water scenario. He further elaborated that the reduction in storage capacity of the existing dams due to sedimentation is increasing day by day and only in Tarbella 6 million residuals are being stored on a daily basis. “A resource conserved is a resource generated,” he added. He disclosed the impact of mismanagement water resources pave the way for groundwater depletion, water quality deterioration, desertification, food insecurity and ultimately increase in poverty. He also suggested to recharge the groundwater aquifers, conserve the soil moisture, to manage the existing available water resources and to educate the people. He further suggested that along with water experts and managers, the institutes should prepare water diplomats who can speak and debate on water issues argumentatively on the national, regional and international forums. His emphasis was on the effective control on population growth, rapid urbanization, crop pattern policy for effective water conservation. IUCN Country Head Mahmood Akhtar Cheema referring the Pakistan Natural Conservation Strategy said that Pakistan is one of the lowest vegetative countries in the world and so face difficulties to adopt the climate changes. He emphasized the catchment protection, integration of natural resources management, vegetation cover and focused on the target initiatives. He further mentioned the IUCN initiatives for the vegetation of the country and informed that with efforts of IUCN Astola in Balochistan is the first Island in Pakistan which is marine protected. “A just world that values and conserves nature,” is the mission of IUCN, he added. He further shared IUCN initiatives for water conservation in Pakistan and efforts for the formulation of provincial nature conservation strategies. Project Coordinator Water Sector Improvement Project, Planning and Development Department Government of Sindh, Dr. Fateh Marri said that water seems the top priority of the future government in the province and also the efforts are being made for the for the formulation of provincial water policy. “Climate change is not only a threat but an opportunity as well if we could avail it efficiently and effectively,” he added. He further said that knowledge comes from the habit of doing things excellently, like the habit of hard work, the habit of taking the challenge as an opportunity, and a habit of being committed. He appreciated the efforts of the MUET National Water Center for preparing young generation who has sought the sustainable and cost-effective solutions to water challenges of the Country. Dr. Rasool Bux Mahar chaired the plenary session, and Dr. Najma Memon from the University of Sindh performed as secretary of the session. Later on, the two separate technical sessions were held at in the Auditorium and Conference room of the Center. Where around 28 young researchers from USPCAS-W MUET, University of Gujrat, NUST Islamabad, University of Agriculture Faisalabad presented their research papers on water governance, water and health, irrigation water management, crop water productivity, integrated water resources management, sustainable groundwater management, flood forecasting and river engineering, water quality and scarcity, waste management, environment policy and economics, water sanitation and health science, urban water supply and demand, climate change impacts and adaption, soil salinity, water-logging and drainage and other related thematic research areas of water and environment. Former MUET Vice Chancellor Dr. S.M. Qureshi, World Bank Representative Mohammad Abid, Dean Dr. Khan M. Brohi, Dean Dr. Abdul Sami Qureshi, Registrar Dr. Abdul Waheed Umrani, Prof. Mushtaq Mirani, Dr. Abdul Khalique Ansari, SAFCO Founder Suleman Abro, Dr. Altaf Ali Siyal, Dr. Muneer Babar, Dr. Abdul Latif Qureshi, Prof. Mohammad Ismail Kumbhar, Civil Society Zulfiqar Halepot, RDF Chief Ashfaq Soomro, SIDA representative Masroor Ahmed Shahwani, Dr. Abdul Aziz Ujjan , Dr. Saeed Ahmed Abro, other faculty members, officers, young researchers from different universities and department attended the first day of the conference.